Click here if you can remember a cheer or song. Be Sure to Right-click and "Refresh" or "Reload" this page to see the latest content. 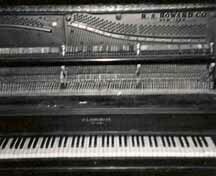 Hymn#135 with Colin Murray's CGI version of the Theater Piano! ARE WE IN IT? WELL, I GUESS! HYDE BAY HYDE BAY - YES, YES, YES! John Mercer writing - Any more stanzas out there? Tom Lynn writing 08/16/2011 -- I remember the "cheer" as having the words "are we IN it?" (rather than "WITH it"). I most remember the cheer being used as the baseball team was dismissed from lunch to head to the game (as we stamped our feet on the floor). Also, although the cheer wasn't original to Hyde Bay (I heard it on an episode of Kukla, Fran & Ollie), I understood that someone in the Theatre Dept came up with the 2nd verse using names of Civil War generals (well ahead of Ken Burns' tribute). David Dube 06/20/12 - How about these memorable lines from one of the camp plays, could have been the same one? Just a snippet, and in my mind I have Josh delivering the lines? And, that line sometimes gets in my head and WONT go away, just like the many memories. That I've used on other people. All is quiet far and wide. Sits unmoving on each side. For Clairol dyes and Russian dressings. But most of all for this small rhyme. Could also have remembrances of great/pitiful performances and/or snafus. As well, as intermission act memories (e.g., The William Clark Five). Servant to King: Sire the peasants are revolting. Colin Murray 07/13/12 - While we were on the subject of Sunday Services, it occurred to me that one hymn in particular was a perennial favorite as exemplified by the general gusto with which it was delivered whenever it was on the menu. Soooo, since it was a mission for God, with His permission, a fifty-year time-jump took me to the theater and that old upright which was in significantly better shape than the one in the lodge. 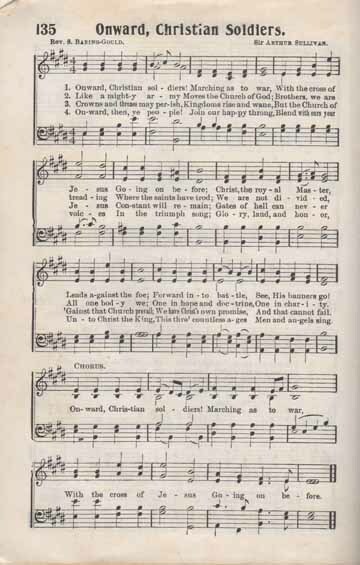 The hymnal was a 1926 edition, and that, in its thirteenth printing! Old. Attached is the sound it made and the music and lyrics to #135, neatly ripped out of the book; there was a hefty surcharge for extra luggage. 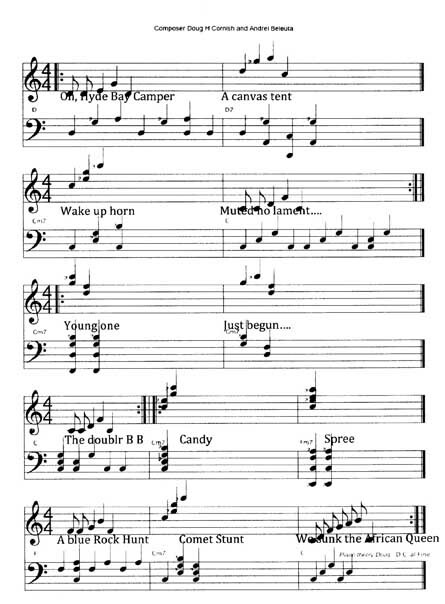 Remember to sing along with this! Colin recreates the somewhat brash sound of the theater piano in his CG version of hymn #135 as we might have heard it Sunday Morning. Internet Explorer and Safari browser users may not be able to hear this link. Recommendation: use another browser. Quoting Home Letter July 13, 1959, "The feature of the day was the bringing in of a piano, new at least to us, transported from a nearby Grange in our faithful truck with Mac Mellor playing appropriate selections as they passed various historic spots en route." Add your cheer or song here -write as much as you want. It will be added with the next upload (frequent). Copy and Paste from a word processor, or type it in the Comments. If it is long, the Comment section will automatically add a scroll bar.